By now our love of National Parks is pretty obvious, as is our love of hiking. Whenever possible, we like mixing the two, enjoying great scenic views while doing a little bit (or a lot!) of exercise. 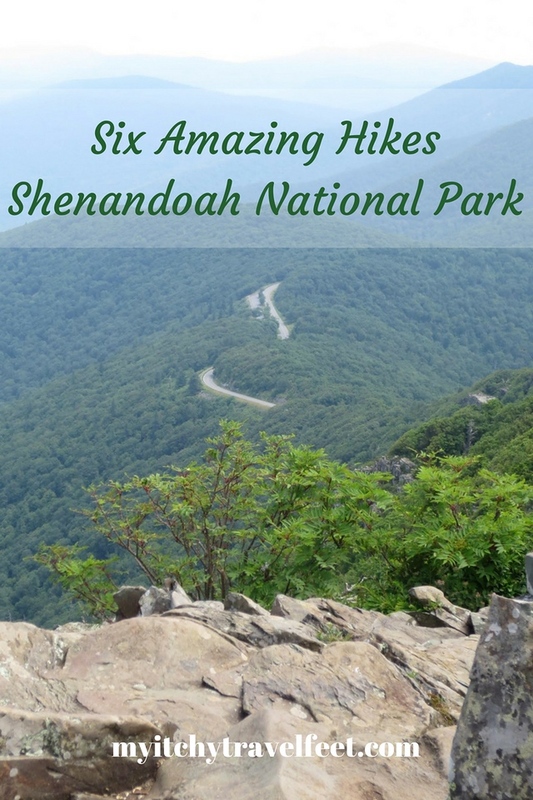 Although we have had the pleasure of hiking around the world, today’s guest contributor, Suzan L. Jackson from Book by Book, is taking us to a new destination with tips for Shenandoah National Park hiking. My husband and I have visited National Parks all across the U.S., but one of our favorites is also the one closest to home for us: Shenandoah National Park in Virginia. Shenandoah is a long, narrow park running along the top of a ridge in the Blue Ridge Mountains. This makes it a great place to visit anytime of year but especially in summer, when temperatures up on the ridge-line are often 10 degrees cooler (or more!) than down in the surrounding valleys. View of the Blue Ridge Mountains from the peak of Bearfence Mountain. 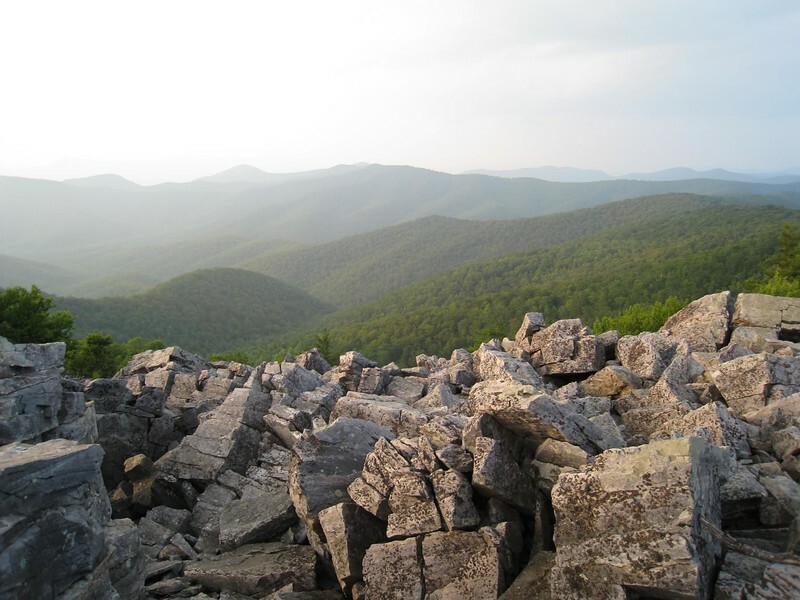 Shenandoah boasts a wide variety of terrain, including hardwood forests, rock outcroppings, lots of waterfalls, and mountain tops and overlooks with amazing views. 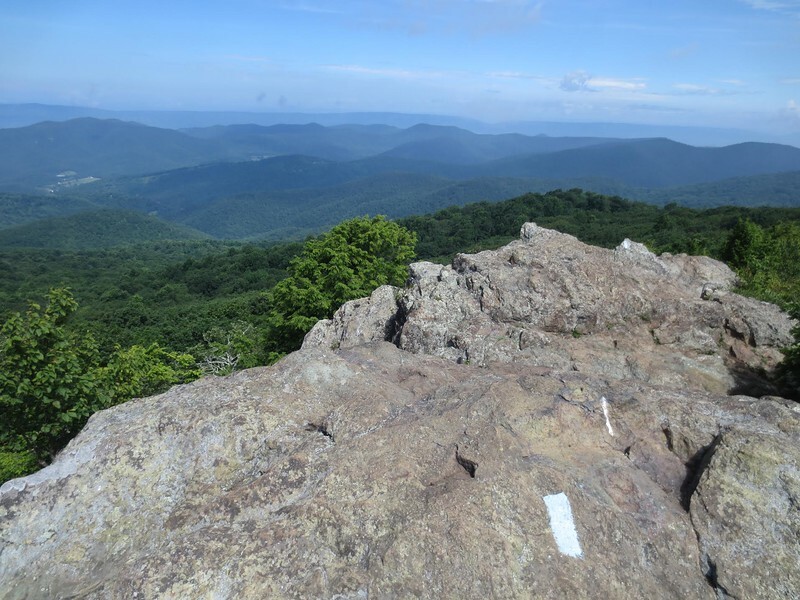 Here are some of the best hikes in Shenandoah National Park, in a range of lengths and difficulties, though most are easily managed by baby boomers or just about anyone. The Appalachian Trail runs through the park, so many of the park’s trails cross or run along part of the AT. I highly recommend picking up a trail guide (for sale in any of the park’s gift shops), with detailed instructions and maps for dozens of hikes in the park. One of my favorites is the pocket-sized Falcon’s Best Easy Day Hikes Shenandoah National Park by Bert and Jane Gildart. 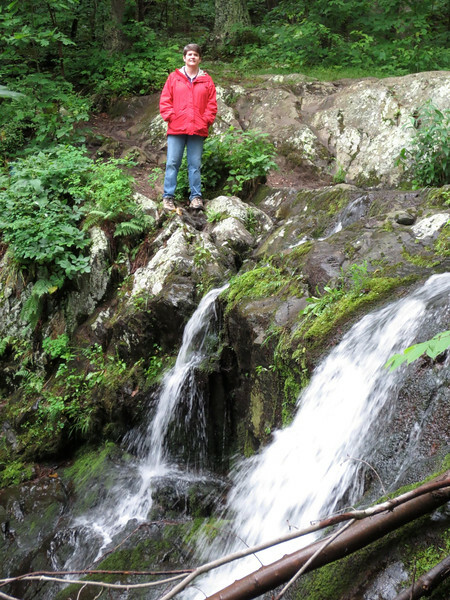 Suzan at Lands Run Falls. Lands Run is a smaller waterfall (technically, more of a slide), but it is one of the most easily accessible in the park. The hike descends from the parking area along a fire road about 0.6 miles to the falls. As you hike, you are surrounded by towering hardwood trees on all sides. Take your time at the falls (and watch your step on the slippery rocks!) to enjoy the rushing water, and look for salamanders enjoying the wet environment. When you are ready, return to the parking area the way you came—uphill this time—for a total 1.2-mile hike. Like all Shenandoah waterfall hikes, this one starts on the ridge, goes down the mountain some distance to the falls—and then returns uphill. What goes down must come up! Most of the downhill hike is very easy, along old roads through the dense forest, with the last 0.3 miles leading to the falls a bit more challenging. The pay-off here is both a 30-foot waterfall and a cave carved into the granite rocks. The total distance round-trip is about 5 miles. View of Skyline Drive & Blue Ridge Mountains from Stony Man. Stony Man is the park’s second-highest peak and is easily accessible for most via a 1.4-mile round-trip hike from the parking lot at the north end of Skyland (for a longer hike of about 2.9 miles, start at Little Stony Man Cliffs Parking area at mile 39.1). 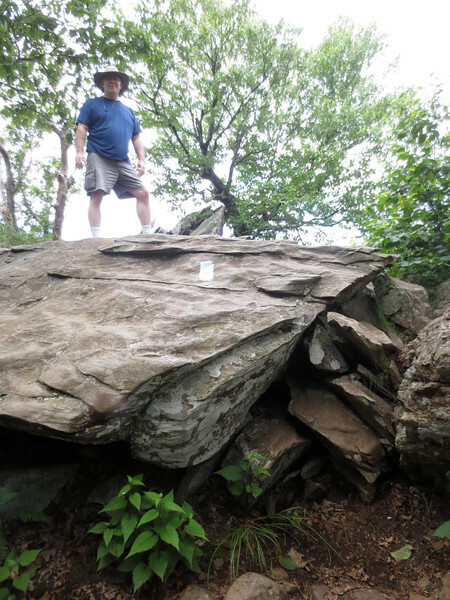 Hiking through hardwood forest with rock outcroppings, there is about a 350-foot elevation gain to Stony Man peak, with gorgeous views of the surrounding valley, Blue Ridge Mountains, and the park itself. A small side trail to the right as you leave the peak will take you to two more amazing viewpoints. The Bearfence Mountain Trail Goes UP the Rocks! Bearfence Mountain is our favorite hike in the park. It is only 1.2 miles round-trip but with very challenging terrain to reach the mountain peak, so bring your hiking poles. The familiar blue blazes marking the trail are, in this case, often painted on rock faces and pointing straight UP! It’s a fun trail to hike, with a lot of rock climbing (no technical climbing skills or equipment are required but definitely wear hiking shoes or boots with good, grippy soles). At the top, you are treated to 360-degree views of the Blue Ridge Mountain, the valleys on either side of the ridge, and the Shenandoah’s dense forests and mountaintops. Need help planning your next National Park Adventure? Check out our favorite travel tips and gear in the National Park Travel Planner! Boulders at Blackrock Summit in the Evening. This is an easy 1-mile trail following the AT. It’s a lovely one for an evening walk with gorgeous sunset views of the Blue Ridge Mountains, especially if you are staying at close-by Big Meadows Lodge. The trail loops around a huge jumble of boulders—a sight to see in itself—with wonderful views of the surrounding valley and mountains. Rattlesnakes sometimes hide among the rocks, so watch your step if you are on the boulders. 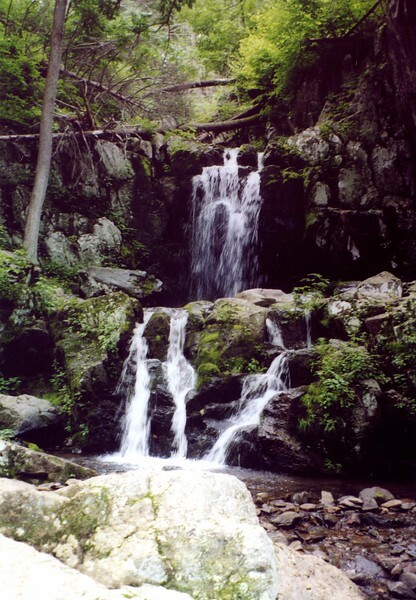 This is our favorite waterfall trail in Shenandoah, a 2.7-mile round-trip hike to the upper falls (28-feet high), and a total 3.2-mile round-trip hike to the lower falls (63-feet high). It’s a fairly easy trail, though like all waterfall trails in the park, it’s all up on the way back! The falls themselves are beautiful and well worth the trip, but we also saw a lot of wildlife on our way down, including a 5-foot long black rat snake stretched out on a tree branch and a copperhead curled under some raspberry bushes, so keep your eyes open and watch your step! 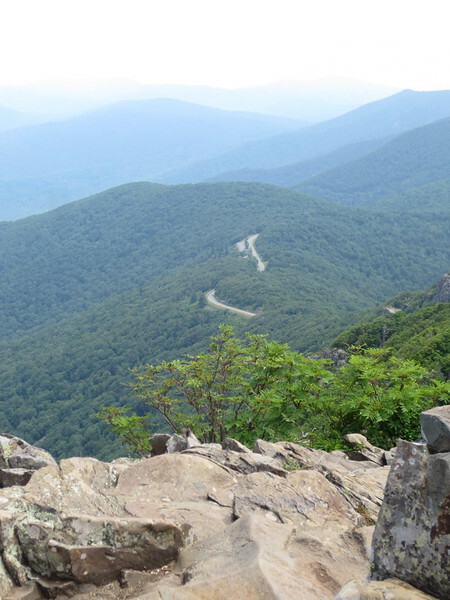 Start your search for hotels in Shenandoah National Park with us! Shenandoah National Park hiking offers a huge amount of diversity and many dozens of trails to try, of all lengths and difficulties. You may want to choose a section of the park—northern, central, or southern—stay there in a lodge, cabin, or campground and explore that section. Whatever you do, Shenandoah is a beautiful place with wonderful hiking trails, so get out of your car and enjoy it up close! Do you have favorite hiking trails to share? Come join the conversation at the My Itchy Travel Feet page on Facebook. Or send us an email with your thoughts. Disclosure: Affiliate links are included for your convenience. However My Itchy Travel Feet receives a small portion of the sale at no additional cost to you.